Shopping in France is one of life's great pleasures. However, while those seductive weekly markets offer regional products, from lavender in Provence to cheeses in the Auvergne, you have to search a little more for real bargain shopping. Luckily, there are huge opportunities for bargain and discount shopping in France for those who know where to look. Here are some suggestions for bargain shopping in France. Outlet centers and malls are scattered throughout France. Some are easily accessible by public transport, but others are out of town, in the suburbs, or in industrial zones where you will need a car. They all have excellent facilities: large car parks, ATM machines, child play areas, information centers, and cafes. Plan on spending several hours for serious shopping. If you're in Paris, there's a great discount shopping and outlet mall at La Vallée Village, just outside Disneyland Paris at Marne-la-Vallée. Thirty-five minutes from Paris and five minutes from Disney parks, La Vallée Village is a popular shopping destination for visitors to the French capital. This is the best place for luxury names, both French and international. Unlike many of the other centers outside Paris, you can get to it by public transport from the middle of Paris. Book in advance on the Shopping Express from central Paris, leaving from the Place des Pyramides at 9:30 a.m. (return from La Vallée Village at 2:30 p.m.), and at 12:30 p.m. (return from La Vallée Village at 5 p.m.). Book Shopping Express tickets online; at the Cityrama office, Place des Pyramides, Paris; or at the La Vallee Village Welcome Centre. By public transport: The RER, TGV, and Eurostar all serve Disneyland Paris/Marne-La-Vallée. The closest TGV station is Marne-la-Vallée-Chessy/Parc Disney station. For the TGV, check the sncf website. For the RER (Line A4), take RER A and get off at Val d'Europe/Serris Montévrain station. It’s a 10-minute walk, or board the shuttle to La Vallée Village on Sundays, running every ten minutes. For RER information, check the RER website. For Eurostar, check the guide to Eurostar. Roubaix, a suburb of north Lille, has the largest conglomeration of factory shops in the Nord-Pas-de-Calais Region. Worth checking out are A L’Usine, and the McArthur Glen Factory Center, which has upmarket labels. Troyes has France’s biggest collection of factory shops and discount malls, all within easy distance of the center of Troyes. Troyes is 170 kilometers (105 miles) east of Paris and accessible by train. There are two major outlet malls in Troyes. At McArthur Glen, you have the choice of around 110 shops of upmarket labels, both French and international. You’ll find two Marques Avenue centers nearby on the outskirts of the town, Marques City and Marques Avenue, plus the separate and smaller Marques Decoration, with 20 shops specializing in household items like Le Creuset and Villeroy & Boch. The Marques Avenue website has details of its other six bargain shopping centers throughout France. Sales in France are regulated by the government, though with tough economic conditions. Keep an eye open for signs in shop windows advertising Promotion (deal) or Soldes exceptionnels (exceptional sales). Winter sales usually start on the second Wednesday in January; summer sales normally start mid-June and run until the end of July. However, there are exceptions to this in six departments near the French border: Meurthe-et-Moselle, Meuse, Moselle, Vosges, Landes, and Pyrenees-Atlantiques. If you’re a lover of fine china and porcelain, seek out Royal Limoges in Limoges, Haute Vienne. Limoges Magasine d’Usine, 54 rue Victor Duruy in Limoges, tel. : 00 33 (0)5 55 33 27 30. Cooks all over the world flock to the Le Creuset Factory Outlet, 880 rue Olivier Deguise, Fresnoy-le-Grand, tel. : 00 33 (0)3 23 06 22 45, near St Quentin in northern France, directly east of Amiens. Romans-sur-Isere, just near Valence in the Rhone Valley, is not only known for its Marques Avenues shopping discount mall but is also known generally for its factory shops, particularly shoe shops, and it is a magnet for bargain shopping. More information is available from the tourist office, Pavillon de Romans, 62 avenue Gambetta, tel. : 00 33 (0)4 75 02 28 72. In Lyon, the world center of silk-making, seek out the Atelier de Soierie (Silk Trade Workshop), 33 rue Romarin, tel. : 00 33 (0)4 72 07 97 83. It's a few meters from the place des Terreaux, near Hotel de Ville. Here you can get one-off items from the supplier of major designers in Paris. Many small towns and villages have vide-greniers sales (literally "emptying the attics") in the summer. Some are good; some are not so good for the bargain hunter, but they are always fun. The sellers are a mix, including locals emptying their attics or barns, and professional brocante dealers. It’s easy to tell which is which: the dealers have large vans, renovated furniture, and better items; the families often have children selling their toys and parents getting rid of well...pretty much everything. There are wonderful bargains at these fairs, like old bistro glasses; a slew of mismatched plates and crockery; a food safe of lovingly oiled wood with a brass handle at the top to hang it from the ceiling; and a coffee set of extraordinary jungle designs that were fashionable ten years ago. Vide-greniers are easy to find. Handmade signs around the villages announce the sales, which often come with local festivals and the odd rustic dance and fireworks. Or find information on sales in the area at the local tourist office. Additionally, check out the excellent French website which lists many of the sales by Department as well as local Christmas markets and special brocante fairs. The French love their depots ventes, shops or warehouses where you can buy second-hand goods. They exist all over France; just look for the signs outside buildings. Many of them are commercial ventures and one-off, but there are a couple of organizations that fall into that category with outlets throughout the country. There is an Emmaus store in Le Puy-en-Velay in the Auvergne as well as Emmaus outlets all over France. They are part of the Emmaus Movement, founded by L’Abbé Pierre (1912-2007), a French Catholic priest who was a member of the Resistance in World War II then became a politician. The Emmaus Movement helps the poor, the homeless, and refugees. The Emmaus shops collect donations then sort, sometimes repairing/renovating the items, and sell. The shops are run by volunteers and are often pretty chaotic. They can yield the odd treasure, but they can also be depressingly full of junk. You'll just have to take a chance. We've found collections of cutlery for a couple of euros, a collectible small Pernod jug, odd china, and a chair that may be full of woodworm but is very beautiful. You will need to check with the local tourist office for locations of the Emmaus shops. The Emmaus website advises you in French to get in touch with your local store, which is not very helpful. Troc is another, thoroughly commercial, organization with depots all over France. Again, you take pot luck. You have to sort through an awful lot of stuff, and they take new items from bankrupt shops as well. Our latest haul included a wooden cradle with a basket, a set of butchers’ hooks that double as coat hooks, and an old wine stand. We rejected a rather battered wooden statue of Serge Gainsbourg in his early years looking pretty disheveled and have regretted it ever since. 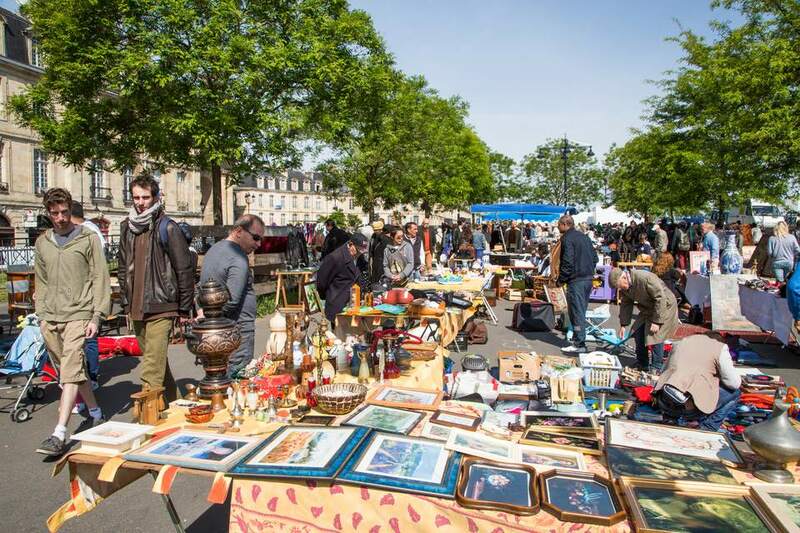 There are hundreds, probably thousands, of brocantes markets all around France, but gone are the days when you could be guaranteed a bargain. The French have developed a fine taste for those old tins, quaint farm implements, and Art Nouveau and Art Deco china. But like all these things, they are fun and you can pick up the odd bargain. If you see something you fall in love with and it’s a bit more than you budgeted, go for it anyway. In Paris, the most famous flea market is the Marché aux Puces at Saint-Ouen. Open Saturday, Sunday, and Monday, it's famous the world over and you find both professionals and ordinary people there, sifting through mountains of goods. Again, some are great, some are distinctly odd, and some are not great. But it's a Parisian experience nobody should miss. The biggest braderie (car boot/garage sale) in Europe takes place every first weekend in September in Lille. It’s an amazing occasion and well worth a visit, but you should plan it a little like a military campaign as it’s huge and can be very confusing. Amiens also has two major braderie fairs: on the last weekend of April and in October. Down in Provence, L’Isle sur la Sorgue is an antique dealers' town, a little like Hay-on-Wye in Wales is a book lovers' paradise. Apart from the regular dealers who are there year-round, there are two events worth noting. At Easter and in August, they hold a fair that attracts over 200 sellers, both serious antique dealers and brocanteurs.